Vibratory Polishing Services | Certified & 75 Yrs Exp | ISO Finishing Inc. Vibratory Polishing Services | Certified & 75 Yrs Exp | ISO Finishing Inc.
Vibratory Polishing (or Vibratory Finishing) is a process of mass finishing and is most often used to burnish, clean, color, deburr, deflash, degrease, descale, radius, refine, dry, and offer pre-plate or pre-paint finishes of parts, amongst other various process applications. Vibratory Finishing is one of the most common style of mass finishing. It’s preferable to other methods of deburring in that it allows the load to move as one unit – this prevents parts from being bent or distorted. It’s also highly customizable based upon the desired finish – and the skilled operators here at ISO Finishing know exactly how to adjust the machine’s frequency and amplitude based on whether the parts require the removal of burrs and radius edges, or if finer finishing is in order. Regardless of whether it’s titanium deburring or any other metal deburring or radiusing, this method provides reliable, uniform results. Whether it’s high energy polishing or vibratory finishing services you need, ISO Finishing has the solution. See for yourself how our state-of-the-art processes allow for superior results. Contact us today to learn about our vibratory finishing services. What is Vibratory Finishing (Polishing)? The vibratory finishing process is a batch-type operation where specially shaped pellets of media and the workpieces are placed into the work chamber of a vibratory tumbler. The chamber of the vibratory tumbler and all of its contents are then vibrated. The vibratory action causes the media to rub against the workpieces which yield the desired result. Depending on the application this can be either a dry or wet process. At ISO Finishing our vibratory finishing and deburring services are second-to-none thanks to our use of ISO certified, state-of-the-art processes. 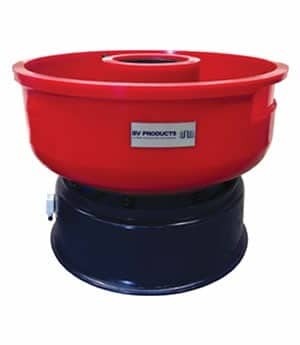 We use the most efficient vibratory bowls available on the market. Not only do we use the most technologically advanced machines in the industry, but we also distribute a comprehensive range of equipment and materials for achieving the perfect surfaces- as well as maintaining an extensive demonstration and job shop facility for many different types of applications. What Sets ISO Finishing's Vibratory Finishing Apart From The Rest? Why is Vibratory Polishing So Important? How is Vibratory Polishing Different Than Centrifugal Barrel Finishing? The vibratory polishing process typically creates smoother surfaces and can reach inside deep cavities or parts with a cylindrical or tubular shape. The process can be used for a variety of parts that a barrel tumbler would be incapable of finishing. Vibratory polishing tends to be the safer and preferred choice for delicate parts or large parts that could be damaged in a barrel tumbler, since the part only moves a fraction of an inch per stroke, as opposed to sliding the full diameter of a barrel tumbler. Vibratory machines are easier to load and unload, take less time, and tend to keep parts cleaner and allow the parts to maintain a better color. One advantage over other other mass finishing processes is that interior surfaces are able to be subjected to some action. So this works great for parts with a lot of nooks, crannys and grooves. Another major advantage is that the process of handling the parts and required ingredients can be easily automated. What Process is Better, Vibratory or Centrifugal Barrel Finishing? There are many factors to consider when utilizing mass finishing processes. Most often these factors can be broken down into four major areas: Equipment, Media, Compound and Workload. Even a standard mass-finishing job has many elements. Iso Finishing understands that each step of the process must be evaluated to determine what is best for a single or series of applications.. With CBF process is pretty straightforward it does not use any vibrations or tracks to orient the components. The process starts with opposing barrels or drums (either two or four barrels) that are positioned circumferentially on a turret. As the turret rotates at high speed, the barrels are counter-rotated, creating very high G-forces or pressures, as well as considerable media sliding action within the drums. 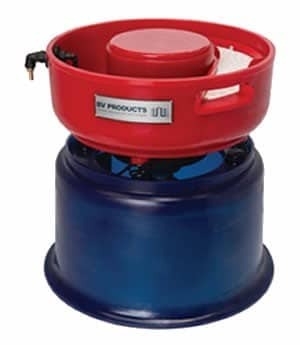 Vibratory machines can remove material from pockets and recesses and inside bores, which cannot be done in a barrel tumbler, so they can be used for very delicate or intricate parts. With high speeds and a short stroke, they can also run large bulky parts without damage. Vibratory finishing systems also lend themselves to be automated easily. They can be fully automated for a flow-through operation or used as a basic batch operation. Barrel tumblers work well for jobs requiring heavy burr removal. They are also good for burnishing, rapid radiusing of edges, heavy deburring with or without media and tumbling die-castings to break the parts off the runner. Barrel tumblers are a good choice for very heavy loads that will not run well in a vibratory finisher. Most parts or products require some type of preparatory process to be completed like grinding, burnishing or polishing before being plated. After ISO Finishing completes the pre-plating process, the majority of those parts continue on to be electroplated in Gold Plating, Silver Plating, Nickel Plating, Black Nickel Plating, Copper Plating, Brass Plating, or Electroless Nickel Plating. What Does Vibratory Polishing Have To Do With Pre-Plate Finishing? The presence of burrs, parting lines from castings or other surface imperfections affects the adherence, continuity, and general durability of plated materials. Whether a part is being plated for protective, decorative, or functional reasons, the quality of the plating is dependent upon the proper and thorough pretreatment of the surface. Metal surfaces often require polishing and buffing prior to decorative plating. Iso Finishing understands the importance of pre-plate finishing. Our knowledge and experience allows us to match your part design and production volumes to the equipment and finishing methods best capable of efficiently processing the job successfully. Polishing is not only used to enhance the appearance of a part, it also helps prevent contamination of instruments, remove oxidation, create a reflective surface, optimizes performance and can prevent corrosion in pipes. When it comes to machined parts, smoother is better for reducing heat and friction. With turned, ground and even lapped surfaces there will be peaks and valleys on the surface area that will create some degree of turbulence and increased heat. The process of vibratory polishing that removes those peaks will help to reduce the heat and friction. The manufacturing industry often demands that OEM’s have many partners. ISO Finishing prides itself on the outstanding customer service it provides. We offer product development support and technical service to help reduce cost and meet all quality requirements before, during, and after the production cycle. Our engineers get involved early in the estimating, design and plating specification process so that you can reduce costs earlier. Vibratory Finishing, and is often also referred to as mass finishing. It is a mechanical/chemical process for mass produced parts for accomplishing the deburring, radiusing, smoothing, polishing and degreasing of the parts. In this process the parts are submerged in media and compound (specially treated water) within a vibratory finishing machine. The machine vibrates causing the contents to move in a circular motion and the media to grind against the part to get the desired finish.This process is used for both very small and very large workpieces with either simple or very complex shapes.